Germany's Patrick Lange dropped a sub-2:40 marathon performance to break the Kona, Hawaii course record at the Ironman world championships (photo: Donald Miralle). A triathlete broke the 2:40 marathon barrier on Saturday at the Ironman world championships, the first to do so on the Kona, Hawaii course. Germany’s Patrick Lange dropped a 2:39:45 to break a longstanding record of more than 27 years. Lange averaged 3:47 per kilometre for the marathon in 29 C heat after swimming 3.86K and biking more than 180K. The marathon came after approximately five-and-a-half hours of racing at the world championships, which requires athletes qualify for the prestigious event. Lange’s time broke the previous record held by Mark Allen for 27 years, according to Ironman Live, who ran just over 2:40 in 1989. It was a German sweep on the podium as Jan Frodeno, the 2008 Olympic triathlon champion, won the event while Sebastien Kienle was second. Frodeno ran 2:45:34 in the marathon. Athletes raced for more than eight hours on Saturday. The top marathon performer moved from 23rd to third thanks to his incredible run. Patrick Lange, 3rd place, is first person to go sub-2:40 in Kona marathon — 6:06/mile in 84 degrees after 2.4-mile swim and 112-mile bike. Earlier this year, Canadian Brent McMahon dropped a fast marathon at the end of an Ironman running 2:42 in Brazil. 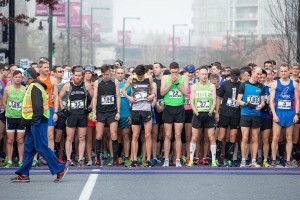 McMahon (30th overall) and fellow Canadian Lionel Sanders (29th overall) ran 3:14 and 3:17 for the marathon on Saturday. RELATED: Athletes strip down for underpants run at Ironman world championships. The top marathon time by a woman came from the winner, Daniela Ryf, who ran the 42.2K course in 2:56:51. The relatively flat marathon course produced fast times on Saturday despite the hot temperatures. Ryf, who represents Switzerland, averaged approximately 4:11 per kilometre for the marathon. Canada’s top female performer Heather Wurtele, who finished 12th overall, covered the marathon portion of the three-discipline event in 3:19:46.